With a single USB-C Hub, you will no longer be constrained by the limited ports on your laptop. You can connect to seven devices at once and stay connected to all the devices. Increased productivity. Increased efficiency and a super cool work lifeis what iMXPW SANTORA Brings you. High-speed Data Transfer and Fast PowerCharging, 2 in 1 port. Ultra-fast Data Sync, data transfer speed up to 480Mbps, iMXPW SANTORA allows you to download an HD movie or 125 songs in less than one minute. Lightening speed Fast Charging facility with charging speed up to 2.4A. With iMXPW SANTORA Type-C Adapter get connected to a large-screen TV with a 4K/3D display malles watching the FIFA World Cup such a pleasure and instantly transform your living room into a home theater. HDMI (Output): HDMI (3840*2160@30Hz,1080P@60Hz) , Supports audio and video synchronized transmission. 1×USB 3.0 Port:Support data transfer rates up to 5Gbps. 2×USB 2.0 Ports:480 Mbps of Data transfer rate. works with most USB keyboards and Mice. *This card reader port supports SD/Micro SD card up to 128GB. *Note: The data transfer speed could be affected by multi-port simultaneous reading. USB 3.0 interferes with 2.4GHz Wi-Fi and other wireless devices because of similar frequencies. According to Microsoft, the problem occurs only in the 2.4 GHz wireless band, but not at 5 GHz. Please set your router as 5GHz. For best performance power output of devices connected to iMXPW SANTORA USB Type C Hub should not exceed total current of 900mA maximum. Otherwise, output current may become unstable or disconnected. 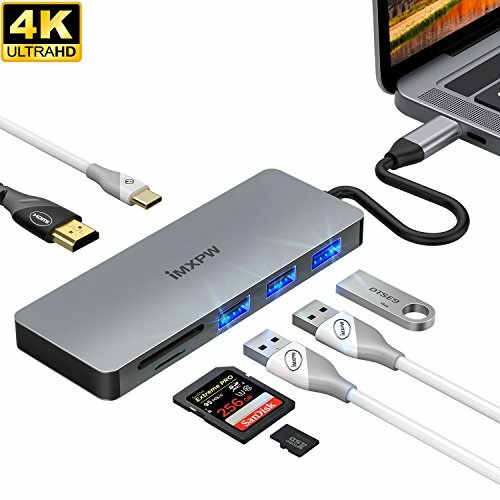 7 in 1 USB-C DIGITAL AV MULTIPORT ADAPTER - iMXPW SANTORA USB-C adapter with a cable connector, for connecting a Type-C equipped PC or Mac laptop to an HDMI display, SD/Micro Card Reader, while also connecting 3 standard USB devices. HDMI PORT/DEX Mode - iMXPW SANTORA USB-C to HDMI adapter supports up to 4K resolution (3840 x 2160 @ 30Hz) enabling clear audio and video. Supports Samsung DEX and Huawei PC Mode function by connecting your smartphone and monitor via HDMI port. TYPE-C PD & DATA PORT - iMXPW SANTORA Macbook Pro HUB allows for pass through charging to power a PC/Macbook laptop. Supplies power up to 87W (20V/4.3A), and supports data-transfer speed of up to 480Mbps. USB C to USB 3.0/2.0 Adapter - iMXPW SANTORA Macbook Pro USB adapter for connecting and charging USB-A compatible devices and peripherals; fast USB data-transfer speed of up to 5.4Gbps; maximum current output of 0.9 Amps. USB 3.0 port is also backwards compatible with USB 2.0. MAC-STYLE DESIGN - iMXPW SANTORA Macbook Pro Accessories is slim and portable USB TYPE-C HDMI Adapter with a sleek anodized aluminium body that provides better heat dissipation and 18 months worry free warranty. If you have any questions about this product by iMXPW, contact us by completing and submitting the form below. If you are looking for a specif part number, please include it with your message.